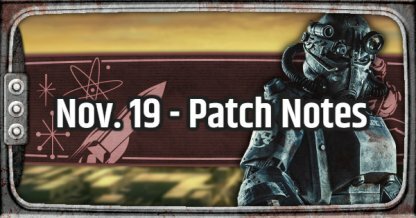 Learn all about the Nov. 19 Update for Fallout 76 in this guide! Included here are patch note breakdowns for the update's numerous bug fixes and stability and performance improvements. 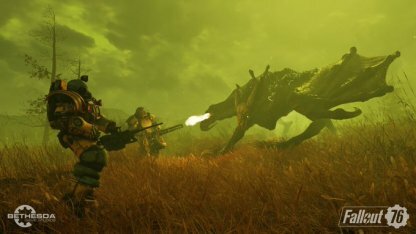 As the first update for Fallout 76, the patch focuses more on improving the overall stability of the game and fixing the bugs found by players. The patch has been implemented for all platforms. The patch includes a number of stability fixes to address problems during gameplay and other issues concerning performance. Stability improvements were also added for the Fallout 76 game client and servers! Instability problems when players access certain menus have been resolved. Visual problems including shadows and graphic problems have been fixed. The camera has also been updated to have smoother panning when the player enters furniture. Enemy chase distance has been fixed so enemies won't follow after players further than designed. Nuke Code Pieces can now be looted from Ghoul and Scorched Officers as intended. The patch has resolved a number of issues for the blueprints, plans, and repair bugs. The biggest fix is on the issue where an items becomes broken again after just being repaired! The Prickett's Fort Token Dispenser under the Bureau of Tourism quest has been updated. It can now be repaired and cannot be walked through by players. Issues regarding wrong language, invalid hotkeys, and social UI has been resolved.